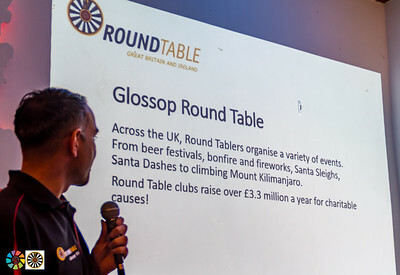 Glossop and District Round Table 2017 Charity Presentation : It was great to once again cover the charity presentation evening of the Glossop and District Round Table, which also included a presentation from and on the work of the Glossop Mountain Rescue and the Buxton Air Cadets. The event was another fine example of the work done by volunteers to improve and enhance our local area, with donations been made to the Glossop Mountain Rescue, Age Concern Glossop, Jericho Cafe, Crossroads a number of other organisations across the area. Thanks to the organisers for the invitation, and thanks as well to Mettricks on Glossop High St who donated the buffet, and Happiness is Homemade who provided desert. Monday 13th February, was one of those occasions where the various hats combined in a good way, with a ceremony that took place in Glossop Cricket Club to induct Peter Matthews JP as a freeman of the borough of the High Peak. The ceremony was the follow up to a motion at the council in October, which was proposed by the leader of the council and seconded by myself, to propose that Peter becomes a freeman of the borough. Peter was first elected as a councillor to the Glossop Borough in 1964, and served as Mayor of Glossop in 1969. Peter became a Magistrate in 1969, a role he held for over 36 years until his retirement, including been chair of combined High Peak bench, and upon his retirement in 2005 he was placed on the supplementary list of magistrates and retains the title of Justice of the Peace. In 2007 he became an independent member of the Council’s standards committee, becoming chair of it in 2008 – a role he held until the change of the 2011 local government act which created the role of the Independent Person, a role he continues to hold to this day using his experience to guide the council’s standards committee. The event fitted nicely into the theme / feel from the weekend which had been all about local democracy, and Peter been a prime example of the public / civic service and involvement that we need to encourage more of. Last weekend (10th / 11th February), I once again had the opportunity to both attend of cover Notwestminster. Notwestminster is a great weekend of talking, listening and learning on issues around local democracy, held at the excellent Media Centre in Huddersfield. It starts off with a day of local democracy experiments on the Friday, followed later on by an evening of education and entertainment with Notwesmtinster PechaKucha, and then the main event of workshops, lighting talks and the ideas bazar on the Saturday. PechaKucha, if you’ve never heard of it, is a simple presentation format where you show 20 images for 20 seconds each, with the presenter talking along as the slides advance automatically. Last Friday’s presentations themed to tie into Notwestminster, covered the history of local authorities, community information, using digital in local planning and more, not quite as unusual as one of last years offerings which looked at the missing parts of the Godfather trilogy.